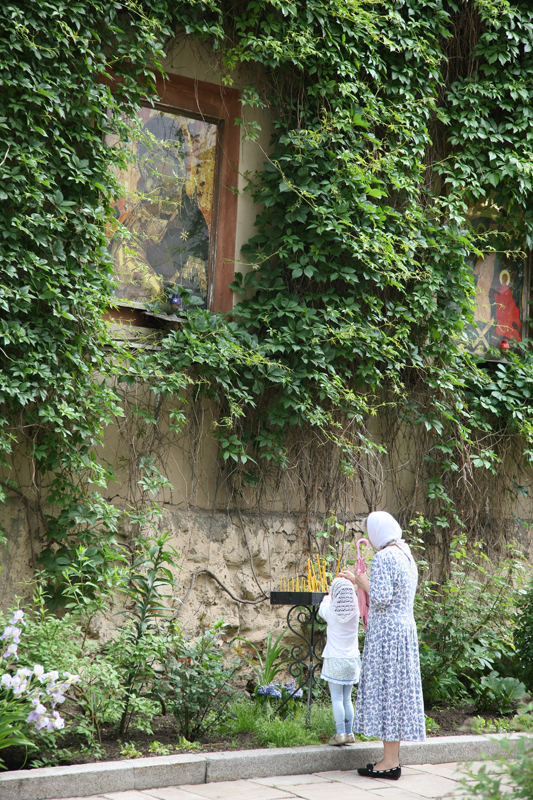 The Vladimir Icon of the Theotokos is honored three times a year: on May 21/June 3, the icon’s role in the deliverance of Moscow from Khan Memed Giray in 1521 is commemorated; on June 23/July 6, the icon’s help in saving Moscow from Khan Achmed in 1480 is remembered; and on August 26/September 8, the Meeting of the Vladimir Icon in Moscow, responsible for keeping Moscow out of the grips of Khan Tamerlane in 1395, is celebrated. 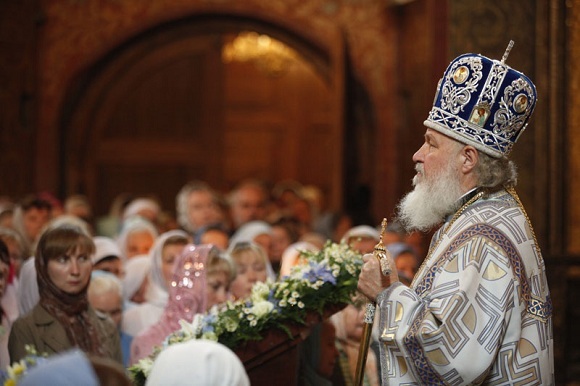 In the following excerpt from a sermon delivered at the Sretensky Monastery in Moscow on June 3, 2009, His Holiness reflects on the spiritual and historical significance behind these three commemorations. There are three annual feast days of the Vladimir Icon of the Mother of God, each one dedicated to a military victory that delivered Moscow from invasion by Khans of the Golden Horde. Bound up with this image of the Queen of Heaven is faith in her special intercession for Moscow, Russia, and the Russian Church. This explains why this image is so revered in Moscow and throughout our entire Fatherland. What does the historical event remembered today, reflected in the Church’s memory and celebrated liturgically on this holy feast day so marvelously, teach us? It teaches us a great deal. When the townsmen learned of the vision [of the icon in Moscow in 1521], they understood that the Lord, through the intercession of the All-Pure One, had forgiven their sins. In the minds of our pious ancestors, the Khan’s invasion was firmly related to their sins; it was seen as a punishment for sin. This is how military defeat, civil unrest, and upheaval in our people’s history were always perceived. People lived deeply religious lives; faith was not at the periphery of their lives, but at the very center. The majority of our people had a vibrant and deeply personal experience of religion, one that apprehended the Divine presence in their lives. Therefore their fear of God was strong. 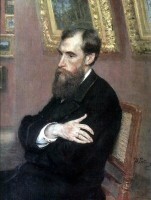 When misfortunes took place, it would never have occurred to them to explain these cataclysms as being the results of political, economic, social, or other causes; they would not place the blame somewhere off in the distance, defending themselves against God’s judgment, as if to say: it is not we who are guilty, but this series of coincidences, these laws of history, or whatever else. Everyone has the right to his own interpretation of history, and scholars explain it in their own way. The Church, however, has the right to examine the historical paths of a nation spiritually. The believer also has the right and ability to see the hand of God both in his own life and in the history of his Fatherland, as well as to perceive Divine punishment. If we hold on to this view of history, much from the past will become clear to us and much in the future can be guarded against. The history of our Fatherland – as perhaps no other – teaches us that God’s judgment takes place not just in eternity, but also in history. The Lord, showing His justice, punishes people – and sometimes this punishment is quite awful. The Old Testament is full of such examples. Our history, too, demonstrates that God is not mocked. But Divine punishment is not a display of some sort of despotism or cruelty, as non-believers often take enjoyment in saying, placing the very existence of God into question. Divine punishment is a manifestation of His righteousness and justice, without which the world could not exist; it establishes the balance without which every human system would collapse. Divine punishment is always manifest in such a way as to show God’s love of people through their correction. This day, like the many other feast days bound up with the history of Russia and our Church, helps one to understand and experience a great deal; and, pressing forward, to remember that the Lord does not punish us only in our personal lives. Not only individuals, but also the human entire community, has been subject to punishment from the universal flood to the last, horrible World War. Our individual fates and the fate of the Fatherland are in the hands of each of us. This is why we should guard the faith, keep the fear of God, and always remember not only God’s love, but also His punishment, remembering that God’s truth will always be revealed, no matter what attempts have been made to expunge and cast it out from human life. And if God’s truth is present, then there is hope for the eternal triumph of Divine justice and the victory of good over evil. The Protection of the Queen of Heaven, which in times of trial has time and again safeguarded our country and people from affliction and even ruin, likewise safeguards us now from every evil, helping us to tread the path shown to us by the Lord with faith, hope, and trust in the help of God and the intercession of the Queen of Heaven. Amen.